The Satake RMSA Minisifter is a high capacity yet compact, free-standing unit used for separating particulate material in the food, chemical, pharmaceutical, plastics and similar process industries. The machine is capable of making up to 4 size separations per machine with a variety of internal flow schemes. The entire stack of 6 sieves is gyrated in a 51 cm circle at 250 rpm on a horizontal plane. Immediately the stock enters the head of the machine it is directed by the feed spout on to spreader which distributes it evenly over the to sieve cover. The rotary movement of the machine conveys the stock along the cover and some of the finer particles fall through the screen onto the sieve collecting tray, to be discharged at right angles into one of the trough channels. Material larger than the cover aperture size travels over the sieve, falling on to the head of the sieve below, where a similar size separation is made. The coarse material or overtails continue to travel over the remaining sieves, turning over and reversing their direction of flow as they pass from sieve to sieve, until a through separation of the various size fractions is made. During the sieving operation, the mesh apertures are kept constantly open by the action of the dome and pad type cleaners bounce against the whole of the underside of each sieving cover. The Minisifter is delivered in a fully assembled state, having been balanced and extensively test-run at the factory. Installation involves only bolting the machine to a firm foundation, cutting holes in floor for outlets, making electrical connections, and finally connecting up the inlets and outlets. The main machine components are the base frame and drive, pulley and eccentric mechanism, sieve carrying frame, sieve stack, sieve clamping mechanism, and the sieve mountings. The base frame is a rigid one piece casting. 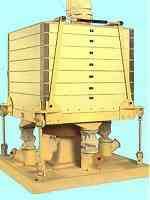 Mounted on this is a heavy casting carrying the drive pulley and self-contained motor with twin Vee-belt drive. The drive pulley and eccentric mechanism are combined – the pulley carrying the necessary balance weights and the sieve stack drive being transmitted through and eccentric stub. The main drive shaft is located by a taper roller bearing that carries the weight of the pulley and eccentric mechanism. Heavy-duty roller bearings on the bottom of the drive shaft and on the stub shaft contain all the centrifugal forces. Rolled steel channels bolted to form a quadrangle and covered with a steel plate serve as a carrying frame for the sieve stack. The steel plate also carries the housing for the top bearing. Sieves stack on top of one another to form a nest. These sieves are made from two parts – the outer sieve carrying frame which is divided in to stringers to form channels on three sides, and the loose clothing frame which is a cross braced structure with the sieving material stretched across its upper surface. The timber sieves are manufactured from premier quality materials, laminated with plastic. All sieves are perfectly square and interchangeable. Loose clothing frames are braced across the centre to present nine compartments containing dome-and-pad type sieve cleaners which are retained by a 9.5mm supporting mesh. Collecting trays for the throughs of the sieves are tin. All edges of contact between sieves are sealed with the best quality felt to ensure an extremely leak-proof arrangement when the clamping load is applied. Alternatively, Satake InterLock Food Quality Sieves are available. Each corner of the bottom carrying frame is fitted with a clamping bar which extends to the top of the nest of sieves where they are tied across by a steel tube. Clamping is achieved by a toggle device connecting each pair of clamp bars which, when tightened, draws them closer together and consequently downwards at the same time. This, coupled with locating pegs in the corner of each sieve, ensure rigid fixing of the whole sieve arrangement. The entire gyrating parts are supported by 4 steel mounting bars with rubber bushes at each end, formed into a universal coupling to allow the necessary gyratory motion. Each mounting device is adjustable in height to achieve perfect levelling of the sieve stack.